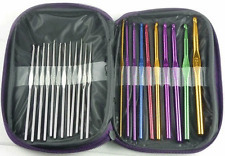 Clover Crochet Hooks are perfect to satisfy your love of crocheting. If you're interested in getting started with crocheting or already an expert, the Clover Amour Crochet Hook Set is a great tool to have on hand. 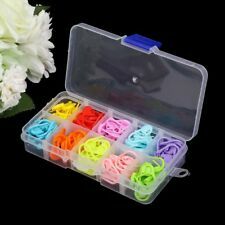 This Clover set comes with 10 hooks in different sizes and a variety of colors. The included hooks allow you to work with the thinnest to the thickest yarns. Set of 8 Susan Bates Silvalume Soft Ergonomic Handle Aluminum Crochet Hook 5.5"
Clover hooks are worth the price! I have tried many brands of crochet hooks and none ever seemed to work well for extended periods while crocheting. Cramping, slipping from gripping tightly etc. I took a huge leap of faith purchasing these hooks because I've read multiple reviews of how they are amazing. Well- they are! My yarn didn't snag even once, and the yarn glides ever so smoothly over the hook! The comfort grips are amazing and make the crochet experience so enjoyable. Worth every penny! I like the fact that the various sizes are all different colors. The handle is comfortable. It's not soft and squishy but better than the hard cold aluminum crochet hooks. The neck or work area is smooth but not slippery. I have been buying additional sizes locally and love them all. I can work much longer and my hands are not in pain. These hooks came super quick, exactly as shown, and I love them! They are now my favorite hook! And they were a great price! If you order these you will not go back to your other hooks! They're amazing! I bought these for my wife. she said it took a little time to get used to them but now she loves them.they are smoother and have a much nicer hook end. Clover Soft Touch Easy Crochet Hooks 8 pcs Portable Case From Japan Japan new.